On Saturday February 17th, the Tolna, ND Volunteer Fire Department held its fourth annual ice fishing tournament and raffle drawing. Each year, 1,000 individuals purchase a raffle ticket with the hopes of striking it big. Included with the raffle ticket is the ability to join the fun fishing ice tournament held on the South shore of North Dakota’s Stump Lake. Unlike 2017, this year brought cold weather and strong winds. The number of ice fisherman decreased due to the weather, however the fishing was still great. All three places in the fish categories were claimed including the largest northern pike that anyone can remember in the history of the event, weighing in at 13.47lb and 38 inches in length. 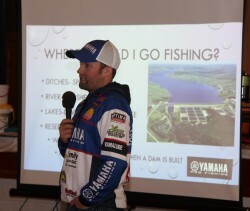 Following the tournament and prior to the raffle drawing, Yamaha/Ranger Pro Spencer Deutz held the events youth and family fishing clinic for the second year in a row. The organizers were not sure how many kids would be in attendance due to the cold weather however they were surprised when 40 future anglers showed up at 3pm to learn about fishing! The future anglers learned about aquatic nuisance species (ANS), fish identification, on the water safety, casting techniques and much more. Following the educational clinic, each future angler in attendance receive a rod/reel combination, future angler t-shirt and fishing journal from the National Professional Anglers Association Future Angler Foundation. They also received a backpack filled with goodies from SunButter Sunflower Butter. In all, 40 future anglers and 38 adults attended the clinic.